For Valentine's Day we cancelled our reservations to Mezze in Baltimore because we were too lazy to drive up there with all the snow, etc. Instead we stayed in to cook and and watch movies. After being together for 5 years it can be just as enjoying cooking together (doesn't happen often) and watching '50 First Dates' and the 4th Season of 'No Reservations'(his gifts to me, yey). I chose the menu: Chicken Parmesan and Chocolate Lava Cake and got all the ingredients (my gift to him). The recipe called for 4 halves, but my packet only came with 3. This part was actually really fun! Put plastic over the chicken before hitting it to keep it clean. In a medium bowl, toss the crumbs with oregano, garlic powder, paprika, 1/4 teaspoon salt and 1/4 teaspoon pepper. In another bowl, whisk the egg whites and milk together. In a third bowl stir together the flour, and the remaining 1/4 teaspoon salt and 1/4 teaspoon black pepper. 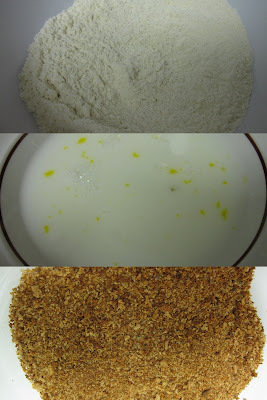 Dip each piece of chicken, 1 piece at a time, in flour, shaking off excess, then egg, then bread crumbs, shaking off excess. I got a little egg yolk in the milk and egg white mixture, oops. Increase oven temperature to 400 degrees. Place breaded breasts in a glass baking dish and spray on each side with cooking spray, about 5 seconds total per side. Bake breasts until cooked though and crumbs are browned, about 15 minutes. Top with marinara sauce, mozzarella and Parmesan and return to oven for an additional 10 minutes. It was really good! I was impressed since it was a healthier version because I didn't fry the chicken. It wasn't as crunchy as a restaurant version, but very tender and flavorful. 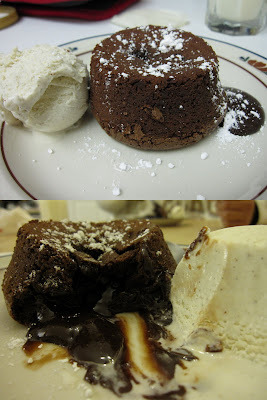 The bf loves Chocolate Lava cakes when we go out to restaurants so I found a high rated recipe by Paula Dean (Food Network) and it was so easy to do. I always thought the melted part in the middle was because of a 'filling', but its not the case! Stir in the eggs and yolks until smooth. Stir in the vanilla and orange liqueur. The edges should be firm but the center will be runny. Run a knife around the edges to loosen and invert onto dessert plates. They're really delicate because the center isn't solid, so be careful when inverting them. I kind of splatted the 1st one I did, haha. I bought some vanilla ice cream to go with it and it turned out perfect! During the 2nd blizzard I wanted to make something "fancier" and made Smitten Kitchen's Chocolate Whiskey and Beer Cupcakes, which I like to call Irish Car Bomb Cupcakes. They are SUPER moist and delicious. A little more of a pain to make since there's the cake, filling and frosting, but it's sooooo worth it. I even got a "I'll pay you to make these again." This is a great recipe even if you just use it for the cake part. Preheat oven to 350°F. Line 24 cupcake cups with liners. Bring 1 cup stout and 1 cup butter to simmer in heavy large saucepan over medium heat. Using electric mixer, beat eggs and sour cream in another large bowl to blend. Add stout-chocolate mixture to egg mixture and beat just to combine. Divide batter among cupcake liners, filling them 2/3 to 3/4 of the way. Bake for about 17 minutes. Why am I so messy with pouring? Disregard the sloppiness, haha. Heat the cream until simmering and pour it over the chocolate. Let it sit for one minute and then stir until smooth. Add the butter and whiskey (if you’re using it) and stir until combined. The bf accidentally bought 'whipping cream' not 'heavy cream' but seemed fine. After the cream was heated, we just dumped in the chocolate chips, which happened to be semi-sweet not bittersweet since the store was out. I also only put 1/2 teaspoon of whiskey because I didn't want it to be overpowering. Came out perfectly after 17 minutes! The recipe suggested using an apple corer or a 1 inch cookie cutter. We had neither of those, so we used a teaspoon to scoop some of the cake out. Let the filling cool a bit before piping it. Put the ganache into a ziplock bag, cut of a corner, and piped it into the middle. Voila! I think I had put too much powdered sugar into the frosting so it was too hard to spread, so we just put a dollop of it on the middle to cover the filling. One of the best things to do when snowed in is to bake! During Crazy Snow #1, I made Snickerdoodles from Smitten Kitchen. I actually made another one of her recipes during Crazy Snow #2, which will be in another post. Her recipes are easy to follow, look delicious and have a TON of good reviews on them. The last time I made Snickerdoodles AKA Cinnamon Sugar Cookies was in Home Economics class in middle school. Do they even offer that class anymore? Preheat the oven to 400°, with one rack in top third and one rack in bottom third of oven. Line baking sheets with silicone baking mats or parchment paper; set aside. I have 6 shelves in my oven, so I was confused as to where I needed to put the racks. I didn't sift mine because I couldn't find my strainer. In the bowl of an electric mixer fitted with a paddle attachment, combine butter and 1 1/2 cups sugar. Beat on medium speed until light and fluffy, about 2 minutes. Scrape down sides of bowl. Add eggs, and beat to combine. I just have a hand mixer and that worked fine. At this point, I chilled the dough for an hour (or you can overnight) before scooping it, because I otherwise found it too difficult to scoop into balls and roll but the original recipe doesn’t find this step necessary. I've seen people wrap the dough into plastic wrap to chill it, but I just covered the bowl for an hour in the fridge. Once dough has chilled, in a small bowl, combine remaining 1/4 cup sugar and the ground cinnamon. Use a small ice-cream scoop to form balls of the dough, and roll in cinnamon sugar. Place about two inches apart on the prepared baking sheets. Bake until the cookies are set in center and begin to crack (they will not brown), about 10 minutes, rotating the baking sheets after five minutes. I used a spoon and rolled the dough into balls. The cookies on the bottom rack were darker on the bottom. I did rotate the baking sheets but I think that's only if your oven bakes unevenly, which isn't my case, so that wasn't necessary for me to do, haha. Transfer the sheets to a wire rack to cool about five minutes before transferring the cookies to the rack. In theory, they can be stored in an airtight container up to one week, but I say good luck with that. The bf loved the cookies even though some were burned if they were on the lower rack. I think I'll just bake one sheet at a time to ensure all the cookies get the middle rack. I thought they were a bit plain, but that's because I prefer my cookies to be super sweet and with a lot going on. These are very light, airy and simple cookies that are a classic flavor everyone can enjoy. My good friend Evil Ben took me to his favorite coffee establishment, which happens to be Seattle's Best Coffee. I actually think this is my former college roommate Elahater's favorite place too. I've never had their coffee and decided to give it a shot. The one we went to is located inside of the Borders Bookstore inside of White Flint Mall in Kensington. I don't believe they have any freestanding stores in the DC area. There were a lot of tables with people reading, studying and using their laptops while drinking their coffee. We ended up sitting near the magazines so we could read and drink. We ordered a 'Vanilla Iced Coffee' and it was really good. I didn't have to add any more sugar or cream. There was no bitterness to the coffee like Starbucks is known to have. You could tell the ice was filtered because of its clarity. It was a refreshing beverage and I'm glad my friend recommended it. We also split an 'Asiago Cheese Soft Pretzel' which was a very light snack to go with the coffee. It wasn't greasy at all, which can happen when you add cheese to anything. Overall, I had a great experience with their coffee, which makes me want to try other places outside of Starbucks. Sorry I don't have the prices, since Evil Ben was being a gentleman. It is also nice that you can bring your coffee/food around the bookstore so you can spend a quiet afternoon eating and reading for free. We've survived the blizzard, DMV people! I don't want to jinx anything since Monday we're supposed to get more snow... Let's not think about it. Just wanted to share the highlight of my week. After not having power for over 24 hours, suffering from cabin fever and shoveling snow like my life depended on it... I've realized there is always a silver lining. I've gotten to know my neighbors and they're great people. We've lived here for 2 years now, and never really had the chance to hang out with the people that live on our block. Mother Nature brought us together to talk and joke around while shoveling. Everyone was helping other people, and it was just a really nice thing. Got to learn about the couple that recently had a baby while shoveling their car out, and talking to the older woman living next door who probably hates our loud music. The girls who live a few doors down (never seen them before) came by one day and asked to borrow our shovels since they didn't have any. Of course they could borrow them! Last night as I was baking, I heard a knock on my door and there they were with a Thank You card and some S'mores supplies as a gift. I was so shocked! I only let them BORROW a shovel, and they genuinely appreciated it. It was too sweet of them. I had to post about it because it reminds you that there are still nice people in the world. They probably have no idea how their kindest has affected me as I didn't know how my kindness had affected them. By the way, I was baking Irish Carbomb cupcakes yesterday, so I'll post about them soon! I can't wait to use these supplies. I saw a cool S'mores brownies recipe on Foodnetwork.com that I might have to use. On an ironic note, our shovel actually got stolen by someone else a few days ago, so that goes to show the world isn't full of nice people, but it's really special when you encounter one. A few weeks ago I met up with my cousin and my closest girlfriend for "girl catching up" time. We all went to college together, and as we get older it's harder to find time to hang out. We decided to go to Cafe Asia in DC. It's a casual/trendy place that serves Pan Asian (Asian food from across Asia) cuisine. Parking was a PAIN! There are meters but one quarter gets you 8 minutes. Who has that much change on them? It was a Saturday, and the meters said parking fees were enforced on Saturdays too, but many meters didn't have $ in them. On top of that, we asked the host at Cafe Asia for change and he said he didn't have any. We then asked our waitress and she told us to ask the guy up front because he has A TON of change. So I went back and asked for $3 in change out of a $5, and he asked if he could keep the $2 as a tip...ever heard of customer service?! So the closest metro is Farragut West on the Orange line. I'd highly recommend that, or remember your quarters. There are 2 floors inside along with a very mod/white interior. Lots of plastic and sitting on ottomans. It looks like there are real chairs upstairs. Here is the bar. I think it becomes a pretty happening place at night, but for lunch it wasn't anything special. They have a fairly big menu. My cousin ordered the 'Drunken Noodles- Thai brown sauce with minced chicken & fresh basil on flat rice noodles' for $10. The portions were large though, so she took a lot of it back. My newlywed friend ordered the 'Chicken Satay- 8 skewers of satay served with Indonesian fried rice, topped with peanut & fried shallots' for $12. I tried one and the chicken was very tender. Good large portioned dish. The highlight of the meal was the dessert though! Women love dessert, so we shared a 'Combo Banana- Vanilla ice cream & Indonesian fried banana topped with dry coconuts, peanuts & honey' for $6. I don't know if I would go through all of the traffic and parking troubles to go there again. Maybe it's different at night, because during the day its like any other normal restaurant. Perhaps if I go back I'd get something other than sushi because it was very mediocre. The prices are very fair with the amount of food they give you. Our waitress was fine, but the host was being difficult. For my cousin's 25th birthday, us ladies went to Lima Restaurant and Lounge off K St NW. We chose this place because we could eat dinner and then stay to party afterwards. They serve 'Latin-infused' cuisine. Street parking is difficult in the city, but there's valet parking for $6 if you're only eating dinner, otherwise it's $20. The closest metro station is McPherson Square on the orange line. The lower picture is their covered seating area with heat lamps outside. The bouncer checking ID's to get into the place was really rude to us when we asked him to take a picture of us. Not cool. Lima is 3 floors. The entrance is on the 2nd floor with the hostess stand, bar and projector TV. The Ravens were playing that night. After waiting around 35 minutes for our table (we had reservations too), we were escorted up to the 3rd floor. The interior is kind of trendy with glass, stainless steel, etc. They also had another screen behind us. 1. The empty table behind the screen was then filled with some important people that had cameras following them around and recording them eat. We think it was The Real Housewives of DC. So the wait staff was literally running around to make sure things were perfect, managers were yelling, etc. 2. 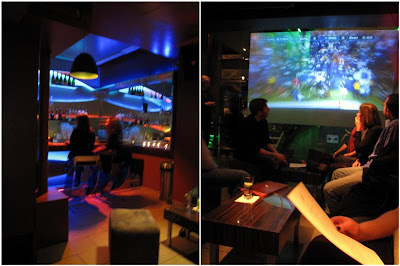 It was a Saturday night, so the place turns into a lounge with a DJ at 10pm. We had reservations at 9pm..
3. They were showing the Ravens in the playoffs on both floors. 4. It was DC Restaurant Week. For dinner all 5 of us decided to get the pre-fixed restaurant week courses ($35.10 for 3 courses), so the prices I list will be as if they were a la carte. We each got a roll with Lime butter. 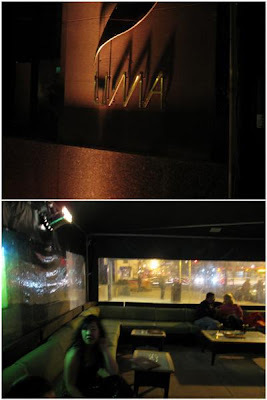 It was so unexpected (yes I know the place is called Lima) but I loved it. Tasted like 'Tostitos with Lime' chips. Top: I ordered the 'Lima's Empanada - beef, pastry, raisin, olives, chimichurri sauce ($10).' It was really flaky with a nice filling, and the sauce really tied the whole thing together. 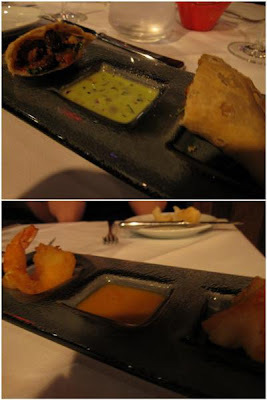 Bottom: 'Wild Ecuadorian Shrimp- lime breaded, ginger passion fruit sauce ($12).' Two friends ordered this and thought the shrimp was good but not with the sweet fruit sauce. Top: 'Salted Cod Fritters -with spicy tomato sauce and lemon ($9).' As you can see, they forgot the tomato sauce and when we told the server there was a bit of an argument amongst the staff about the status of the sauce...hmmm. 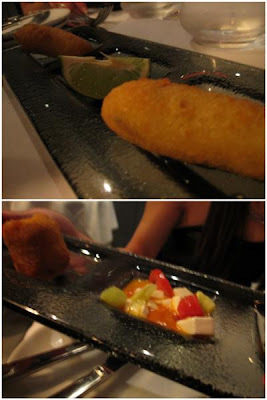 Bottom: 'Chicken Croquettes - with cucumber, queso fresco, spicy tomato sauce and lemon ($9).' She found them to be OK, kind of mushy. The sauce wasn't as flavorful either. For my entree, I ordered the 'Cuban Chicken (Organic) - Half roasted chicken, lime braised red onions, steamed aged basmati, black beans, fried plantains ($24).' WOW the chicken was SO GOOD. Very tender, seasoned well and juicy. The grilled veggies, rice and beans were so good and complemented the chicken. I was very surprised at how good it was and the portions were huge! I only ate 1/3 of my plate. The plantains were like chips, where as I like them soft. 2 of my other friends ordered the same dish. Top: 'Salmon (Wild Atlantic)- Latin spices-blackened, grilled vegetables, yellow corn tamale, chipotle mojo ($24).' My friend thought it was good, and everyone kept picking at the tamale. 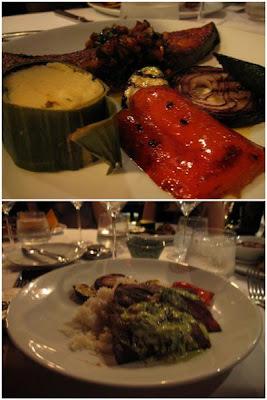 Bottom: 'Lima's Churrasco- Grilled flat-iron steak, grilled vegetables, steamed aged basmati, chimichurri ($24).' My friend didn't think the steak was that flavorful and was mushy. We all agreed... Dessert was a Disaster. Three of us ordered the 'Coconut Tres Leches' , which was so dry! That's the complete opposite of what the dessert is supposed to be. It looked like they took a dry cupcake and poured 3 types of milk over it. Top: 'Warm Chocolate Cake- Vanilla creme & dulce de leche ice cream ($7).' The only way to describe the cake would be: Powdery. I don't know how that is even possible. 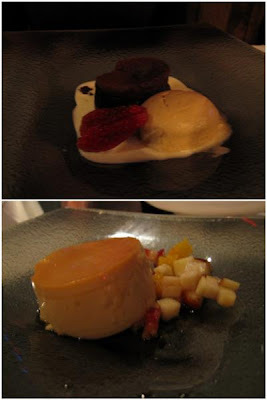 Bottom: 'Flan Caramel - tropical fruit ceviche ($7).' This was the most edible one, but it was more firm than we would've liked the consistency to be. I have mixed feelings about this place. I think there were more negatives than positives. My Empanada, Cuban Chicken and Lime Butter were the highlights of the night. The atmosphere, service and dessert were poor. The food is expensive, so I wouldn't come here if it wasn't for Restaurant Week. We checked out the basement level after dinner for some drinks and dancing. It was packed and an older crowd (30's) were dancing to electronica. 30 minutes to get my car from valet wasn't fun. So, if you want to go, I'd suggest going on a weeknight for food only, or on the weekends for drinking/dancing only.